What is Thrombotic Microangiopathy (TMA)? How does TMA affect my kidneys? What are TTP and HUS? Who can get TTP and HUS? Thrombotic Microangiopathy (often known simply as TMA) is a rare but serious medical disease. It is a pattern of damage that can occur in the smallest blood vessels inside many of your body’s vital organs – most commonly the kidney and brain. “Thrombotic” means that blood clots are involved. In the normal kidney (as in the rest of the body), there are small blood vessels called capillaries. They are lined with a slippery coating of cells known as endothelial cells (see Figure 1). 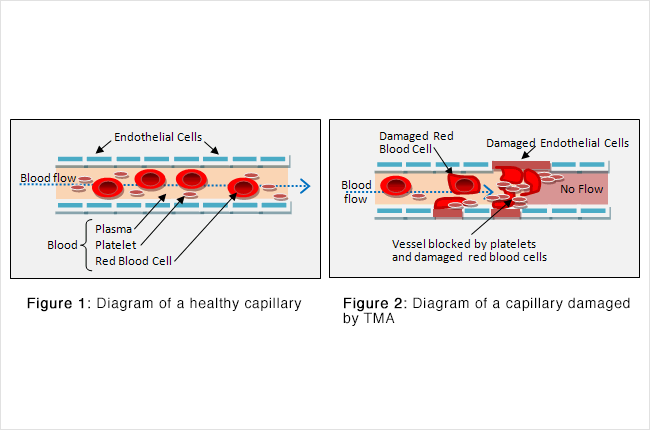 When the endothelial cells of capillaries become damaged, blood flow through the kidney slows (Figure 2). The liquid part of the blood, called plasma, helps waste flow to the kidney to be removed from your body through urine. There are also solid particles in the blood, including red blood cells and platelets. Red blood cells carry oxygen from your lungs to the rest of your body, including the cells of your kidney. Platelets have the job of plugging up any damaged part of the blood vessel to keep it from leaking. Defects in the blood vessel wall lining can produce rough patches that are like potholes on a road – they can slow traffic and cause a lot of damage. Red blood cells can become deformed and then burst. Platelets can activate and cause clots to form. The wreckage from all these events can close off entire blood vessels. In the end, parts of your kidney can die from lack of blood flow, and your body can run low on red blood cells and platelets. TMA causes changes in your kidney that can be seen under a microscope. The pictures below show blood vessels in the main filter of the kidney (called the glomerulus). A healthy blood vessel appears as a circle with an open (white) center. Vessels affected by TMA will be filled with a pinkish material, which is clot. Over time, parts of the kidney may die from lack of blood flow. TMA also changes how a drop of your blood looks under a microscope. Normal blood has completely round red blood cells and plenty of tiny platelets. When you suffer from TMA your blood will have deformed red blood cells (called schistocytes) and no platelets. There are several complex and often quite serious illnesses that can lead to TMA – these are listed in the table below. This article will discuss the first two of these: Thrombotic Thrombocytopenic Purpura and Hemolytic Uremic Syndrome. Given their complicated names, it is best to refer to these by the abbreviations TTP and HUS. In summary, your body becomes unable to keep vWF glue short enough to prevent abnormal clot and damage to the small blood vessels of your body. In contrast, HUS most often occurs when your body is exposed to a certain type of toxin (Figure 4). The toxin usually comes from a bacterial infection of the intestines. Generally this infection must be serious enough to cause bloody diarrhea. The toxin makes its way into the blood stream and then damages endothelial cells in the kidney. This triggers platelets to clot and red blood cells to burst as described above. For unknown reasons HUS usually occurs in children rather than adults. There are also many less typical patterns of TTP and HUS. Doctors have not yet determined exactly why they occur, but they usually only happen to people who already have another chronic medical condition. Examples of conditions that can lead to this atypical TTP and HUS include pregnancy, organ transplant, and diseases like HIV, lupus, and cancer. TTP and HUS are quite rare. A city with a population of 1 million will average only about 11 cases in a given year. Women and blacks are somewhat more likely to develop the diseases. For unknown reasons HUS is much more common in children, and TTP is more common in adults. Your doctor may examine the blood under a microscope to determine if there are any damaged red blood cells (known as schistocytes). Positive testing in a child who has recently had bloody diarrhea will lead to a diagnosis of HUS. Positive testing in an adult makes TTP the most likely diagnosis. A large IV called a PLEX catheter is placed into one of your veins (usually in your neck or groin). Your blood is then carried from that catheter through tubing to a plasma exchange machine. The plasma (liquid) part of your blood is removed and then replaced with plasma from a blood donor. The treated blood is returned to the catheter and then back into your body. This process allows the abnormal glue (vWF) that causes TTP to be exchanged for normal vWF. Treatments usually last a few hours each and continue every 1-2 days for about 2 weeks. For those with repeated episodes of TTP, a medication called rituximab is being tested to see if its use can prevent recurrences of the disease. In contrast, HUS usually improves on its own. Patients will require hospitalization for fluids and monitoring while the disease is worsening. If kidney function declines too much, manual blood cleaning with dialysis may be necessary. As the causative bacterial infection resolves, toxin leaves the body and symptoms of HUS begin to improve. In many of the more atypical TTP/HUS disease patterns the optimal treatment has not yet been standardized. These are often treated (like TTP) with plasma exchange, but there is currently some debate about this. TTP was once fatal in 90% of individuals who developed the disease. Now that plasma exchange is available, survival can be as high as 80%. In many cases the blood vessel damage in the kidneys and brain will reverse with time. HUS has a good prognosis. During the active phase of the disease kidney failure can often be severe enough to require manual blood cleaning with dialysis. Fortunately this is usually temporary. In fact kidney function almost always returns to the normal range within a few months.